Ray Sapko born and raised in Chicago, IL USA, was one of the three founding members of the rock group Tantrum. Recording three albums consisting of all original material, 'Tantrum', 'Rather Be Rockin' and 'Breaking Away", the band toured the USA performing with many well known artists including Ray Charles, Kansas, Rick Derringer, Ian Hunter, Mick Ronson, Mitch Ryder, Nicky Hopkins, Nazareth, Jim Peterik and Survivor and Molly Hatchet. In late 2005 a 2CD compilation set (Rather Be Rocking/Tantrum/Breaking Away) [Escape Records]) was released consisting of all the material contained on the three albums. Says one reviewer, "All in all this entire package features thirty tracks from possibly the most unique and exciting female fronted band in the history of rock music." The song “Applaud the Winner" co-written by Sapko was chosen by Kerrang! Magazine to feature on a compilation called “Konnoisseurs.." The same reviewer comments,"That one song alone is a remarkable introduction to this very talented band." According to The International Encyclopedia of Hard Rock and Heavy Metal: "The three female vocalists sometimes harmonized or took the lead vocals individually - either way it was devastating, and complemented by some great guitarwork from Sapko." 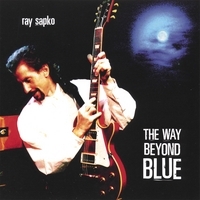 Now for the first time since Tantrum, Ray Sapko has released his first long awaited solo CD, "The Way Beyond Blue", consisting of all original, all instrumental material - a total of ten songs. Sapko states "This project has been close to my heart for some years now. Although I did my share of the writing for Tantrum, this is a very different concept, one where I was solely responsible for the writing, arranging, producing as well as the performing of the material. So far the response to this CD has been extremely positive from both those who are big fans of instrumental music and those who are not." Give it a listen and we're sure you'll agree! Oh yeah, check out the mp3 samples on raysapko.com for a taste of some of the great guitar solos for these tracks and to purchase a copy. After checking out "The Way Beyond Blue" there is one comment that comes to mind - Wow - Ray can play guitar! Ray's hands fly up and down the fretboard on this CD. The songwriting is also solid and the rest of the band is tight. The flying guitar work on "Cirrus" is just one of the tracks that will blow you away. "Reiko's Waltz" provides a melodic dual-lead line, and brings out a more emotional style to Ray's guitar work. "85 Miles Gone" shows Ray's versatility, as he plays this beautiful acoustic song. If you enjoy guitar virtuosos such as Joe Satriani, you'll enjoy this CD. Pick up a copy today!